North Coast Land Conservancy is working on its biggest project ever: conservation of 3,500 acres of forestland above Oswald West State Park to benefit people, plants, and wildlife. Which brings into high relief an issue that all private land conservancies have to grapple with every time they complete an acquisition: what is the right amount of public access for this property, if any? Hikers, mountain bikers, hunters, anglers, dog-lovers: recreationists of all kinds are always interested in exploring new territory. But what are the risks and benefits, the pros and cons, of opening up conserved lands to various kinds of recreation? Every human activity, benign as it may seem, has the potential to cause harm. Off-trail and even on-trail travel can lead to erosion. Water sources can be polluted. Seeds embedded in boot soles can spread invasive plant species. Yet typically it is our personal experiences with wild lands that makes us care about them in the first place, and that lead us to work to conserve them. 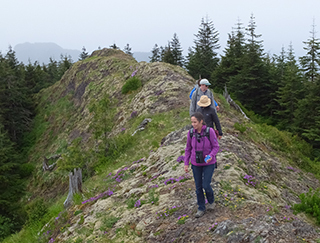 Join NCLC Executive Director Katie Voelke in an open-ended discussion about how to balance the needs of people, plants, and wildlife in conserved lands on the Oregon Coast.